Colliding plasmas are growing in significance due to their potential use in a diverse variety of analytical and processing environments. Colliding plasma studies are being used to model and simulate plasma interactions such as that which occurs on the astrophysical scale and those which are used to explore fusion energy generation. Allied with this is their potential application in materials science processing such as the pulsed laser deposition (PLD) of thin films. Substituting the plasma plume generated by a single pulse with that derived from multiple plasmas is also being explored in standard analytical techniques, such as laser induced breakdown spectroscopy (LIBS), laser ablation-inductively coupled plasma-mass spectrometry (LA-ICP-MS) and matrix assisted laser desorption ionization-time of flight-mass spectrometry (MALDI-TOF-MS). When two or more independently derived plasmas are in close proximity and flowing towards each other, they form an interaction region where the plasmas meet. This region is often referred to as the Stagnation Layer. The key parameters or characteristics describing the plasma within this region include the density, temperature, geometry, composition, and dynamics. 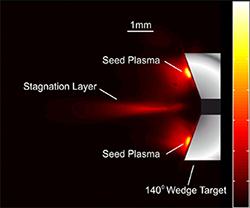 In comparison with a plasma plume generated from a single pulse, the stagnation layer formed from counter-propagating plasma plumes offers a means to significantly improve the control of the plasma and in turn better tailor the key plasma parameters – density, temperature and so on - to the needs of a particular application. For example, control over the density can combat opacity issues that sometimes occur in LIBS techniques. Likewise, control over nanoparticle formation in the stagnation layer can bring benefits to LA-ICP-MS analysis. One of a number of different groups [1-7] throughout the world who have intensified their research efforts in this area is that of the Plasma Physics group at Dublin City University (DCU) under the guidance of Prof J Costello [4,5]. Informed by optical and particle diagnostics they are currently working with research and industry partners to apply the stagnation layer to laser ablation based analytical techniques with the aim to develop and demonstrate key performance parameter enhancements by judicious choice of laser and experimental configurations. Laser produced plasmas are produced with high power short pulse lasers typically with pulses of a few ns duration. Consequently the plasma plumes generated are evolving on the ns to microsecond timescale making an ICCD camera the ideal tool for capturing images and spectra with its temporal resolution capability down to a few ns. The DCU group used an Andor iStar DH334T and an ICCD DH534 in the work outlined in this case study. Figure 1 shows a schematic of a typical setup used for the generation and optical diagnosis of the colliding plasmas. A rotating target, placed inside a vacuum chamber at a pressure of 1x10-7 mBar, is used to refresh the target material. Two seed plasmas are created, which collide to form the stagnation layer (under suitable conditions). Figure 1: Experimental setup for the optical analysis of the interaction region between two laser produced plasmas components of the optical system. Both broadband optical imaging (figure 1(c)) and spectroscopic imaging (figure 1(d)) are carried out simultaneously using the Andor fast gated intensified CCD cameras. Broadband imaging uses a variable zoom lens to focus the image onto the chip of an Andor DH534 camera; this is mainly used to monitor the highly sensitive setup while spectroscopic measurements are undertaken. A second variable zoom lens is used for spectroscopic imaging. 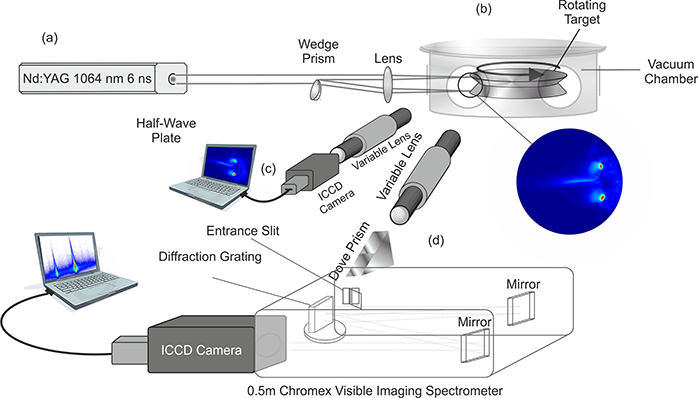 The optical spectrometer comprises a 0.5 m Czerny-Turner mount with toroidal collimating and focusing mirrors enabling aberration-corrected flat field imaging. The Chromex spectrometer is connected to an Andor iStar DH334T model camera. The setup allows for temporal, spatial and spectral resolution of the stagnation layer. A time-integrated optical image is shown in figure 2 of a stagnation layer generated using a tin target. The intensity ratio of the two resulting laser beams was ~1:1 with an on-target irradiance on the order of ~ 1010 W/cm2. The focussed laser pulses irradiated slab targets with a wedge angle of 140° between them and with a seed separation of 1.3 mm. 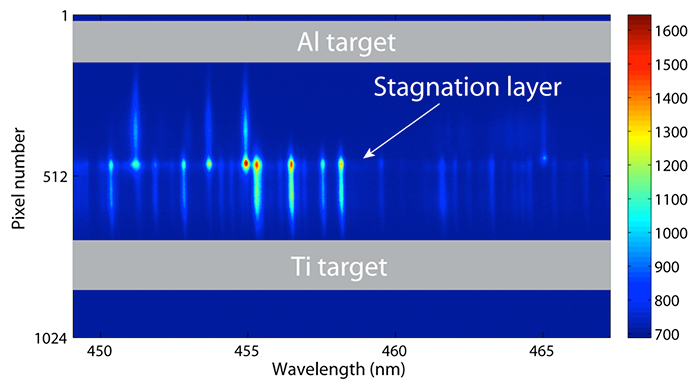 Figure 3 shows a spectrum from a space resolved spectroscopy experiment with two different targets, aluminium (Al) and titanium (Ti), where the plasmas were separated by 2.6 mm. Recorded spectra from each target are space resolved, but spectrally distinct, and so the resulting time integrated spectrum shows the degree of stagnation between the two. It is clear from this figure that the stagnation layer, corresponding to the centre line across the image, is quite well defined and there is little or no interpenetration. Figure 3: Colliding (dissimilar) plasmas of Al and Ti showing hard stagnation with little interpenetration. When two counter propagating laser-produced plasmas collide there are two extreme outcomes. If these so-called seed plasmas have a large relative velocity and low density at the collision plane the plasma plumes will tend to interpenetrate. On the other hand, when the relative velocities between the plasmas are small, plasma constituents will tend to rapidly decelerate at the collision plane, forming a so-called stagnation layer. As time progresses, accretion and compression of the material within the stagnation layer will yield a significant increase in the local temperature and density. In many cases the regime is intermediate between these extremes, often referred to as ‘soft stagnation’ and where an extended region of mixing results from interpenetration of the two plasmas. Where mi is the ion mass, v12 is the relative plasma flow velocity (prior to impact), q is the elementary charge, z is the average ionisation state of the plasma, ni is the plasma density at the collision plane and ln(Λ1-2) is the so-called Coulomb logarithm (all in SI units). The ‘ion-other ion mean free path separation’ refers to the interaction of ions from one seed plasma with those from the other seed plasma. It is clear that the ion-other ion mean free path is highly sensitive to v12. Consequently the latter can be used to control the plasma temperature. This relative plasma flow velocity is determined by laser power density ‘I’ and laser wavelength ‘λ’ via the usual (Iλ2)n, n<1, scaling law. This illustrates one of the ‘control knobs’ for modifying the plasma parameters. Engineering of the laser parameters can be used to ultimately control the collisionality and hence hardness of the stagnation layer, Of course the electron (and hence ion) density is also controlled by the laser wavelength, and as with all plasma engineering, it is the delicate balance between coupled parameters that one is trying to achieve in any specific optimization effort. Experiments have shown that the collisionality parameter ς can be controlled by varying the seed distance, angle of incline of the targets, and input laser parameters, and that by varying ς one can vary many of the properties of the stagnation layer, such as temperature, density, degree of ionisation, and geometry. There is a wide range of application configurations in which the added degree of control over the plume can be utilised, including LIBS, LA-ICP-MS and MALDI-TOF, with the potential to improve performance and reduce costs. Where replacement of the single pulse plume by the stagnation layer is deemed relevant, the minimal optics required and general minimally invasive nature of the colliding plasma setup will result in cost effective upgrades of current technologies. Acknowledgement: Appreciation is gratefully extended to Dr Colm Fallon, National Centre for Science Plasma & Technology, DCU, Dublin. This work is supported by Science Foundation Ireland (SFI).